My Family Tree provides the option to securely encrypt the personal information stored in your family tree file using authenticated 256-bit AES encryption. This simultaneously provides confidentiality, integrity, and authenticity assurances on the data. This may be appropriate if your tree contains the personal information of living people, especially if you plan to transfer your file via email, portable devices or the cloud. Remember that by its design, encryption of this type is virtually impossible to defeat without the password. If you forget the password, you will lose access to all data stored in the file. There is no way to reset or recover the password. If you regularly forget your passwords, we recommend that you write it down with a pen and paper and keep it safe in your home. Whatever you decide, we strongly advise you do not reuse any other password, especially if you choose to write it down. To encrypt a file, go to File>Save As choosing My Family Tree Files (encrypted) from the Save as type box. You will be prompted to enter and confirm a password before the file is saved. Please note that passwords are case sensitive. We strongly advise you do not reuse any other password. Fig 1. Save as an encrypted file. If you encrypt a file you will need to enter the correct password each time the file is opened. Please note that passwords are case sensitive. You can change file password using File>Change password. 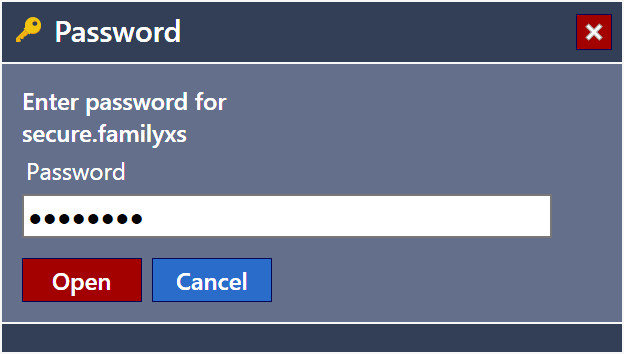 Changing a password requires the current password to be correctly entered. When you are working with an encrypted file, the only visible difference is the display of a key icon in the top right hand corner of the summary panel. If you are using Windows 7 or later, a key icon overlay is displayed on the taskbar for My Family Tree. Fig 3. The key icon in the summary panel (left) and the Task Bar icon overlay in Windows 7 and later (right).